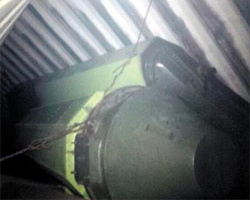 In this image tweeted by Panama's President Ricardo Martinelli, part of a green missile-shaped object is seen in a North Korean ship docked at a container terminal in Colón, Panama on Tuesday. Panamanian authorities on Monday caught a North Korean ship carrying presumed missile parts. Panamanian President Ricardo Martinelli tweeted that his country interdicted a North Korean-flagged ship from Cuba because it was carrying "undeclared military cargo." He posted a picture of a green object that looks like part of a missile. "We had suspected this ship, which was coming from Cuba and headed to North Korea, might have drugs aboard so it was brought into port for search and inspection," Martinelli said on radio. "When we started to unload the shipment of sugar we located containers that we believe to be sophisticated missile equipment." The ship's captain attempted to commit suicide and the crew put up fierce resistance when Panamanian police moved in. The ship is being held for further investigation. "The world needs to sit up and take note: you cannot go around shipping undeclared weapons of war through the Panama Canal," Martinelli said. This is not the first time a North Korean ship has been caught with weapons or parts. In August last year, the Japanese government seized aluminum alloy bars that can be used to make nuclear centrifuges from a North Korean cargo ship in Tokyo Port. In January 2009, the North Korean cargo ship Birobong was interdicted on its way to Africa on suspicion of carrying missile parts. And in November 2008, a North Korean ship was interdicted in Singapore on suspicion of carrying cruise missile parts for export to Iran. The results of the investigation are not known.